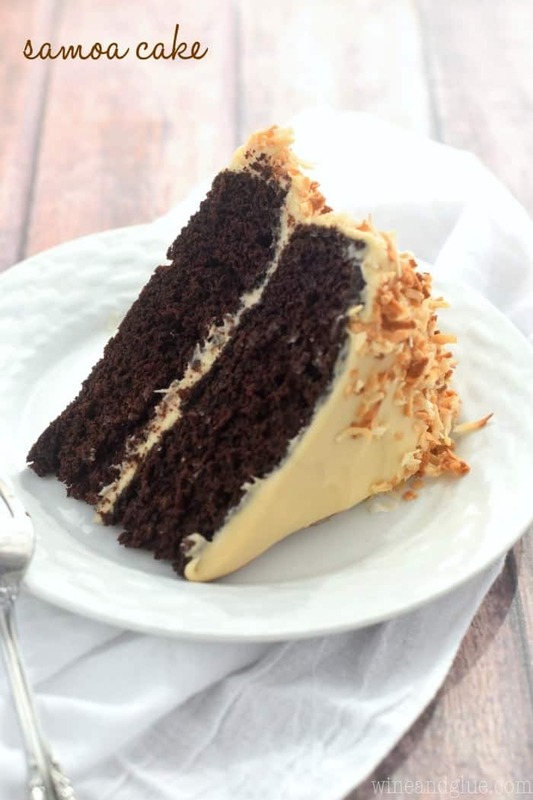 This Samoa Cake is the perfect combination of chocolate, caramel, and coconut. Moist, delicious, and perfectly rich! So, you know how sometimes on Facebook you can see what your friends post on their other friends’ walls? Have you ever gotten sucked into the Facebook hole where you then click on the friend of the friend’s profile? But for the people who do do that, what happens when you click on the profile and then you see that your friend of a friend has two friends in common with you . . . who don’t know each other??? Like you click on Jane’s profile and you see that Jane also happens to be friends with your friend from high school, Sue, and your blogging friend, Fran, I mean hypothetically speaking. But Sue and Fran don’t know each other at all!! But then you realize that you really can’t tell anyone because then you will look like a total weirdo stalker with too much time on their hands. You briefly consider telling your three children, if for no other reason than to distract them from all the yelling they are doing, but then you will have to actually admit that you were in the Facebook hole instead of feeding them/helping them with their homework/getting the paints out. 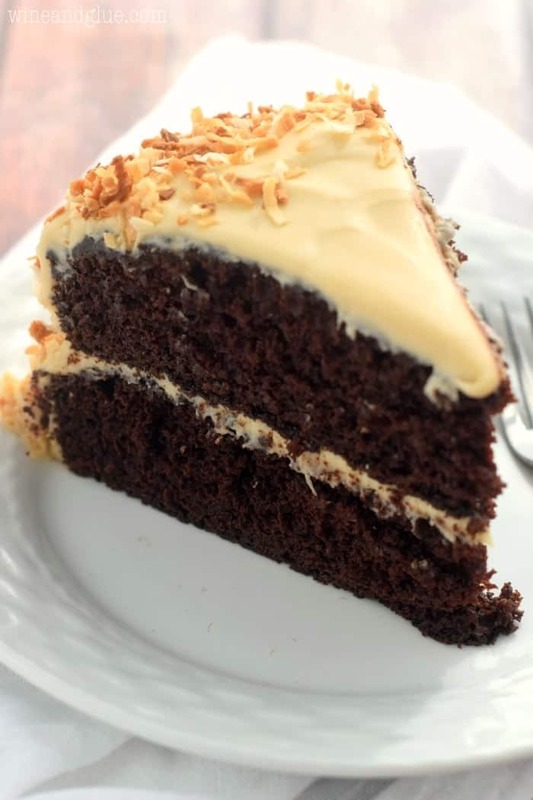 So instead you just cut yourself a piece of this Samoa Cake. There’s nothing hypothetical about that. Seriously. 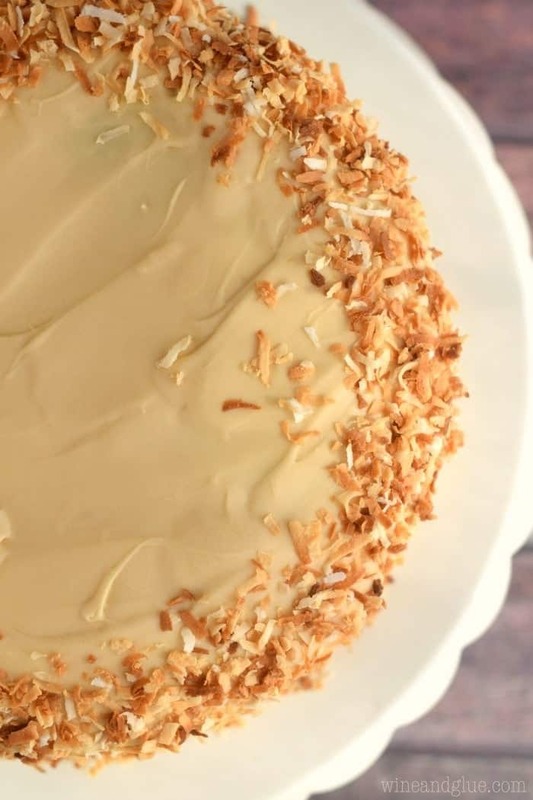 You have to cut yourself a slice of this cake pronto. 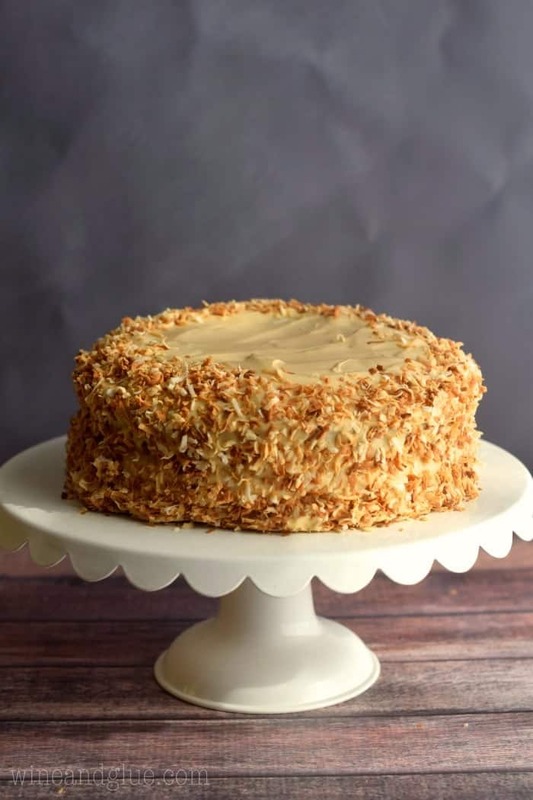 It is a chocolate cake, made with coconut milk, smothered in a caramel frosting that is more of a glaze, and then add some toasted coconut. This is my first layered cake that I’ve ever made. Ever. 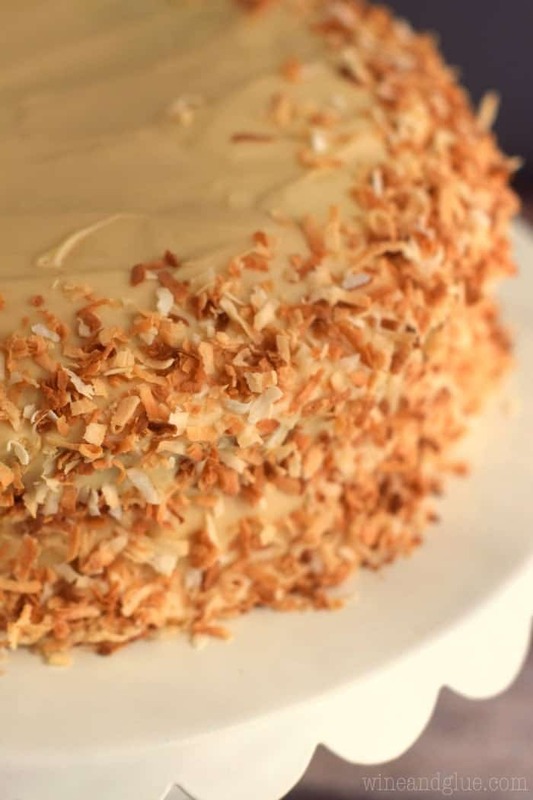 So please forgive the lopsidedness, and instead just focus on the moist coconutty cake smothered in caramel. This cake is going to be mine on every birthday henceforth. Preheat your oven to 350 degrees. Grease two 9 inch cake pans with cooking spray. Add in the eggs, coconut milk, vegetable oil, vanilla, and water. Stir until the batter is fully combined. Evenly distribute the batter between the two cake pans. Bake for 30 minutes or until a toothpick stuck in the center comes out clean. Remove the cakes from the oven. Allow to cool for about 10 minutes in the pan before removing them to cool completely on a cooling rack. While the cakes are cooling, beat the butter until creamy. Then add the caramel sauce, and gradually add in the powdered sugar until smooth. Finally, add the milk to smooth out the frosting. The frosting will be very thick and sticky. Trim the dome off your cakes because you are a better baker than I am. 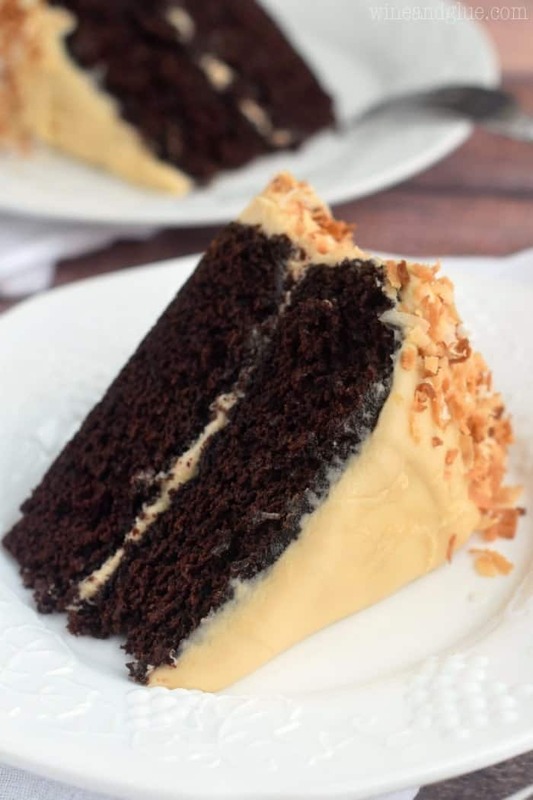 Cover the first layer of cake with caramel frosting. Add the second layer of cake. Cover with more frosting by adding scoops to the top and smoothing out over the sides. You may have frosting left over. 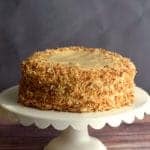 Sprinkle with the toasted coconut, pressing it in the sides. Pour the coconut milk into a large bowl and whisk it to fully combine it before adding it to the recipe. If necessary, put it in the microwave for 30 seconds to make the mixing easier. Ha! You are only human. I think we all play that game. I think. I hope. This frosting looks so magnificent. Perfect on a chocolate cake! Oh I love Samoas SO MUCH! I just posted a Samoa Donut myself, and now I have another samoa recipe to try soon! It looks irresistible! 🙂 Pinning, Stumbling and Yumming! Thanks Sandra! I saw those donuts! They are gorgeous!! Just yes. Yes, yes, and yes. Um, I totally do that. I recently saw two friends comment on each other status and I had no idea they knew each other! Also, this cake. OMG!!!! LOVE IT. Thank you so much! And don’t be ashamed of box mixes. I use them all the time. They are SUCH a time saver. Did you add the coconut milk? If not, next time replace the water with it. SO GOOD! Is this cake dense enough to be on the bottom of a tiered cake? and what do you think about adding choc chips to the mix? Too much? So it totally depends on what size pan you are baking it in. Since I have only made it in this size I would google converting a 9 inch cake pan recipe to what size you are going for and see what adjustments are made for time. I think that adding chocolate chips to a cake is always a risk because they will likely sink to the bottom. If you still want to go for it, I would pour the batter into the pan and then sprinkle mini chocolate chips on top.